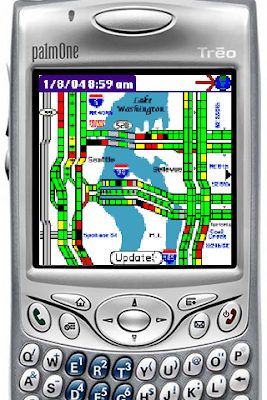 SeaTraffic was an early mobile traffic application originally written by 3Com Palm Computing Inc. for the Palm VII wireless device. This mobile application displayed current Seattle traffic maps by downloading a data file from the WSDOT Internet server and creating Seattle road maps using a multitude of shaded areas to represent current traffic conditions for each road segment. The Palm VII was a wireless personal digital assistant made by the Palm Computing division of 3Com and released in May 1999. The Palm VII unit pricing started at $599(US) with the option of limited wireless service at $14.95 per month or unlimited wireless service at $45 per month. Despite the high price tag, the Palm VII proved popular as one of the first wireless data-capable information devices. In 1999 3Com Palm Computing Inc (Bellevue, WA) approached the WSDOT and proposed a Huffman encoded data stream for wireless traffic data. The data stream included detailed traffic data, time and express lane directions. 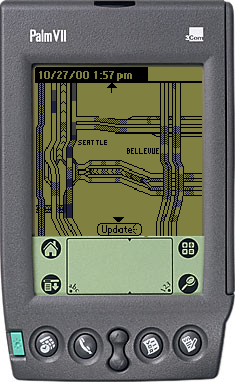 In Jan 2000, the WSDOT made the wireless traffic feed available to the public and SeaTraffic version 1.0 was released. 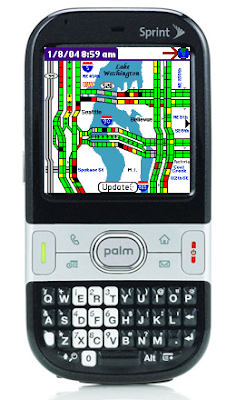 In 2003, the Palm Bellevue office was closed and SeaTraffic was adapted to a multitude of PalmOS devices and made available to the public at pdatraffic.com for free. The SeaTraffic mobile traffic application was updated several times to use http protocol, higher resolution, color, additional traffic detail and additional devices. SeaTraffic is a native PalmOS application and due to the decline of PalmOS devices there are very few remaining SeaTraffic users.